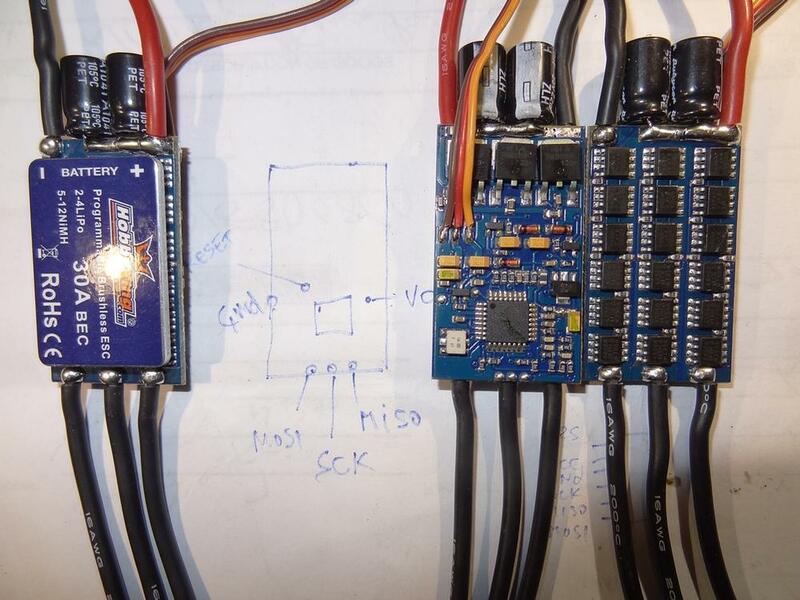 Great efforts, i have 4 12A Blue series ESC... that i can try to flash. Does somebody have pictures of connected esc, because it don't have pads on board. Thanks i will look in to it, but soldering on the IC pins is going to be a challenge. What is the difference beatween this firmware and simonk-s from RCG? today I flew for the first time with the alternative ESCs (thanks ziss). 20A blueseries. the throttle curve needs to be different; hover was at 50%, now at 70%. That was described earlier, so no surprise here. togehter with new freeimu035-ms sensor board I could dial in PID values like never before. Even for me copter was very easy to fly in acro mode. on 3rd battery one motor stopped during flight and copter fell 20m to ground. Reason unknown. is this analogWrite(PWM_PIN[i], ((motor[i]>>2) - 250) + 2); the going code for the alternative firmware (to get maximum power output)? Can you measure current/voltage/rpm at WOT? You can use "AnalogInOut" example from arduino to generate PWM, just constrain the output to the 2-252 range. On the ground everything was working? Can measure volt & ampere. Rpm-meter is on backorder. Will assemble test and compare ESC firmwares. Motors do not always start, sometimes slowly turn wrong direction. But if started properly, no misbehaviour. Reason for crash could have been anything. I am new to quad copers but have a electronics and programming background. I have purchased a bunch of parts from Vocanlo the ebay seller and assembled. I seem to be getting a bit of clicking in the motors which I assume is due to the speed controller refresh rate issue. I am exploring the idea of reflashing to regain the use of the ESC and just for fun I have attached a picture of the ESC's for you to have a look at and was hoping someone could let me know if reflashing these has been done before? Also weather the software is mature enough to try on my first copter. thanks ziss_dm, quax an all the contributors. i've been using Quax 17a firmware on my Roxxy 720 for a while now and it was a big improvement over the original software. today i did a testflight and it feels more stable than before, thank you! pwm_fast.. - 490hz update reate to connect to flight boards. but pwm_fast.. also works with standard receiver. Your board does not have them..
ok, for stock ESC I get max. 6.7A, 10.5V. ok, for flashed ESC (labeled V2 nFET) I get max. 5.7A, 10.5V. I repeated tests several times intermixing the two ESCs. Values are not exact (with battery going weak over time? ), but do represent the overall figure. So indeed the flashed ESC outputs less power, right? How to proceed? I could order one such motor being delivered to your address, if that helps? I will doublecheck with my setup.. In a meantime can you flash latest revision? ziss_dm wrote: I will doublecheck with my setup.. In a meantime can you flash latest revision? I will do that coming weekend. I should use Mystery-20A-nFet.cmd? Currently I only have the gnu toolchain available that comes with the Arduino IDE. From the command files you provide I can see you use a windows tool by the name of avrasm2.exe. Is it possible to do the compile with gnu toolchain also (it comes with 'gnu-as' and would you happent to know the cmdline syntax?) Or maybe you could upload the ready to run hexfile for me here (that way we could be sure to talk about exactly the same version)? Just curious, could it be the specifics of this type of motor that cause the flashed ESC to not output maximum power compared to stock ESC? If it helps I could repeat test with another motor brand. it was cold around zero deg celsius that day, and I have read from blueseries ESC having trouble and szop ( over at RCG) not sure if this applies here as well wwith this fw. I am currently trying to build the firmware for mystery 20A ESCs. Want to run it from arduino with extended input range - so should I use pwm_arduino_250 for input? And what is the difference between Mystery20A_nFET and Mystery20A_nFET-HDD, please? So far I have failed using avra or gnu-as to build a hex file. It is the combination of cpp and assembler directives that produce failure. I currently have no access to Win*, so any solution working on *nix or macosx would be welcome. (I did manage to use avra and build the firmwares from the simonk project (over at RCG) but want to use this wii-ESC firmware. With the help of Crashlander and, of course, ziss_dm, I managed to update my Mystery20A ESCs to latest firmware r192 to run with MultiWii. Yesterday I did a bench test; current draw was approx. 6.6A; basically same range as with stock ESC - good, earlier problem with reduced power solved.?. Today I went outside and flew 3 batteries in the snow before I called it quits with hands falling off. Copter feels as powerful as with stock ESCs. And it is so much more stable. Besides, the sound is better too. I am very satisfied with this now. Well worth the effort. bribe someone with good eyes to solder wires to my ESCs and convert other copters to wii-ESC. This is good to hear! Are you feel brave enough to flight test "Complimentary PWM" (Active braking) version? ziss_dm wrote: This is good to hear! Are you feel brave enough to flight test "Complimentary PWM" (Active braking) version? yes, when I get the rpm-meter to produce more info. what is the meaning of the components of names? - -HDD Heiko says: it is for hard disk (HDD) motors, some parameter differ. ??? when to choose this??? 3) faster response on reduce power. As you can see, slopes almost 2x times shorter. HDD hardware config should not be used in real life, it is only for development.. I need to reflash my ESC's to use it with MWC (in 490Hz pulse mode). My ESCs from ebay are using Atmega8 and have exactly the same pin assignment like bl-17A or HK Super Simple but doesn't have 16MHz resonator. I'm quite comfortable with flashing firmware and fuses, can even compile .asm (when I know what sources should I compile) and I already successfully reflashed some HK SS with Quax "old good" bl-17 firmware. Now I'm reading for some time this forum but I'm completely lost in compiling this "configurable" firmwares because I can't orientate which parts of the source should I include. Additionally I can't find definition file to fit my pinout, even if I expected that bl-17 pinout is the basic and reference one. Can someone help me to build the .hex for 8MHz int. osc. or at least clearly say what parts do I need and what definition file fits bl-17A circuit? I'm afraid freely modify pins in the definition file because there are obviously different philosophy of control needing different hardware comparators etc. and this I don't understand. Sorry and thanks! Today I spent whole evening trying to build firmware for my ESC. First I tried to build it using prepared .cmd files but I was unable to make it working due to paths. Then I tried locate all necessary programs and adjust paths but it simply doesn't work. Unfortunately the building Wiki isn't enough detailed for my knowledge. ;!! Wer mit den Nutzungbedingungen nicht einverstanden ist, darf die Software nicht nutzen !! I tried to test ESC with the motor and it makes thee initial ascending beeps (sounds normal so timing is corresponding to CPU speed), but then (even it's connected to the receiver) I miss long beep which means "PPM detected" and ESC doesn't react to the throttle stick. I tried to include also ppm_light.inc but the result is the same. Do you have any advice? Or more simple - could you please build for me version with TurboJet60A.inc only changed to 8MHz clock with input suitable for Multiwii software? I checked the pin assignment and it's OK. But also try to trim down throttle on your radio. then I can advise you to use bl-17A compatible firmwares. For standard MWC or KK board output it in my case works perfect, I'm not sure if it's the input signal you need to use. I'm using the very old original Quax firmware (posted). It can miss some new features as it's many years old. From this project it should be TurboJet60A variant. I'm not any expert, just "enduser" so please firstly do careful testing with limited power source. Hi Roman, thx for advice.....yes, I thought about this model of HK SS. Yes, this is the board where bl-17a firmware works perfect! I'm using old original version which works great, these new modifications have some improvements but my ESC's are about two years closed in heatschrink and flying great so I don't have reason to test anything else. Another experience with those HK SS - when it happen that some N FET burns in that ESC, it always (at least with 3S battery) burns also corresponding Atmega8 output driving it so even if you exchange the FET and ESC seems to work again, it gives only half of power. Thank you ziss_dm, I tested your firmware (with the fuses 94 C3) and firstly it behaved exactly the same as one I compiled - only 3 beeps and not the 4th. I then trimmed my radio even lower (~980microsec "ZERO" pulse) an I started getting 4th beep. Unfortunately it doesn't work anyway - when I move up throttle stick, motor starts shaking but doesn't start turning. In meantime I found another similar project here: https://github.com/sim-/tgy#readme and the tp.hex firmware works for my ESC. I don't really understand how they tweak internal RC oscillator to 16MHz but some way it works. Thanks you anyway once more for all your help! for my small indlor TRI I found 3 10A plush Escs atmel to use. So we can proceed tests if you want. The complementary PWM pssible only on nFET boards. ;( So it would not work on plush..
ziss_dm wrote: The complementary PWM pssible only on nFET boards. ;( So it would not work on plush..
again, on my big TRI with the 20A mystery blue ESCs flashed to r192 of wii-esc, during 4th flight one motor just stopped at height of 20m. Temperature is around 0 deg C (water freezing) if that matters - but it was 4th flight and copter had been lying in cold before first flight for > 1 hour. Once I will have repaired the broken parts of the CF frame (and having checked for faulty electrics and electronics) now I am all for trying another version of firmware on these ESCs. I have a spare motor, another stock ESC and one spare flashable ESC to compare whatever you want me to run. Can measure amperes, volts and rpms if neccessary. Dear All! I'm sorry of my newbie questions, but I can't found the solution for my problem. I'd like build a tricopter with Multiwii controller, but dont know, which ESC good for MWC. I read the forum, and I think the best solution is the Mistery or HK Blue series ESC, but currently don't stock in Hobby King. I found another esc, which have Atmega controller, external resonator, etc. this is the HK F-20 or F30 type ESC. I read on Simon Kirby's site, the recommended firmware exactly same with Blue Series esc. Can I use on this esc the Quax firmware? Thanks for help, and sorry for my bad english. 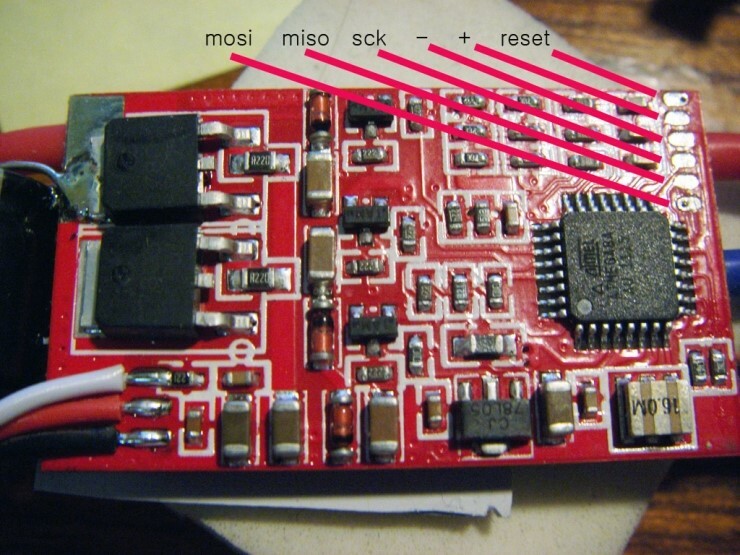 feket663 wrote: I read on Simon Kirby's site, the recommended firmware exactly same with Blue Series esc. Can I use on this esc the Quax firmware? At least I can see 6 programming solder pads on the right, so this is a good start. Thanks. It's hard to tell from the picture, but it seems as this ESC uses 85N3L N-FETs only. So Simon's "bs_nfet" should be the appropriate firmware, according to the spreadsheet. But I don't know which Quax firmware would be the correct one. LenzGr wrote: Thanks. It's hard to tell from the picture, but it seems as this ESC uses 85N3L N-FETs only. If this ESC work with same Simon's firmware than Blue Series, can work with same Quax firmware than Blue Series? feket663 wrote: If this ESC work with same Simon's firmware than Blue Series, can work with same Quax firmware than Blue Series? I honestly don't know, you would have to ask quax directly (he actually contributed to this thread before). But why do you insist on using quax' firmware? To my knowledge, both Simon Kirby and ziss_dm have used his work as the foundation and further evolved the code base since then. Hamburger wrote: Once I will have repaired the broken parts of the CF frame (and having checked for faulty electrics and electronics) now I am all for trying another version of firmware on these ESCs. I have a spare motor, another stock ESC and one spare flashable ESC to compare whatever you want me to run. Can measure amperes, volts and rpms if neccessary. If you provide the new firmware I will give it a try in flight and on the test stand comparing original, current and the 'complementary PWM' versions. So, please fire away. I just purchased the following AVR JTAG debugger and was hoping some could help me with setting up AVR studio to detect it. When I connect it to my pc the serial port appears in my device tree but AVR studio does not detect it. I am also unsure which type of JTAG it is suppose to emulate. Firstly - wow! Your firmware is solving the rather huge problem of getting an arduino to talk to an ESC. Thank you so much Quax and ziss_dm!! BUT, the ESC is not arming. Here's where it gets odd though - when I take out the ground (brown) wire and touch it (with my geeky, sweaty fingers), the esc beeps (arms) and the motor starts twitching. When I put the wire back into the arduino, everything is fine and the motor starts up and follows the programmed values. Do I have to send some particular signal to arm the ESC with the firmware? - I've tried starting the ESC with analogwrite values of 0, 5, 6, 10, 20, 25 and even 50 and 100. - If this is the solution, why would me touching the ground signal have an effect? Are there any settings in the .inc files I need to change to get it to work? - The 'Mystery20A_nFET.inc' Preferences section does not have an 'Overclock' section (as described on the google code wiki) which says that enabling this can have the effect of the esc not arming. ALSO - can't really donate much (as a poor student), but if you were to add a 'donate' button, or send me a paypal address, I'd at least like to offer you a couple of pints. confused_individual wrote: - I've tried starting the ESC with analogwrite values of 0, 5, 6, 10, 20, 25 and even 50 and 100. I don't know Arduino very well, but the AnalogWrite docu says that with 0 the pin is always low. And with 5, the high pulse is maybe too long, because MIN_RC_PULS=18 with pwm_arduino_250. Try 1 or 2 as AnalogWrite values to "arm" the ESC. I'm absolutelly confused with MT3506 motor.. So, there is still nobody made it work well on 4s lipo? So, there is still no solution of those problems or i just use wrong firmware? After procrastinating for a long time, I've flashed the three HK Super Simple 20Amp ESC's on my Tri-copter with latest TGY firmware. Instead of just soldering the programming wires, I made a "clamp" type connector from a plastic clothes-peg and hot-melt glue. I'm using an AVRISPmkII with AVRStudio. A handy feature of the AVRISPmkII its that it has a status LED that indicates a good connection to the pads on the ESC. Simply cut a small "window" in the correct position in the shrink tube....apply the clamp - Voila! I calibrated all three esc's (together) on a tri-Y-lead to a servo-tester. I'm soo glad I've finally done this! There is no more irritating "whine" from the motors, no more "clicking" noise! There is a remarkable difference in the "feel" of the copter. It's more stable in the wind and responds to turbulence far better. THANK-YOU to everyone that contributed to getting it right! This is good to know..
You actually second one, who reported power drop. ;( I will try to investigate in next couple of days. What input profile you was using initially? Later i have tryed to use pwm_fast_200 and it works okay - thrust ~900gr again.